Dubai is a city on the verge: of rising upwards, expanding outwards and realising its ballooning bricks-and-mortar ambition, swollen by oil wealth. There is just one skyscraper in the offing – the dour 149-metre, 39-storey World Trade Centre, on the Sheikh Zayed Road. If Dubai were a colour, it would be beige, much like the sand that it’s built on. Dubai builds up, although in 1999 not a single building was over 200 metres tall. Developers compete to build ever more elaborate structures such as the sail-shaped Burj Al Arab, both on natural and aggressively reclaimed land. There’s a snag: building tall buildings on soft sand is hard. Foundations have to run some 160 metres down. The Burj Khalifa opens with 154 floors of ambitious glassiness – the tallest building in the world, easily eclipsing Taipei’s 101. Visitors are invited to swoon over this desert city from the 148th-floor observatory, bunk up in high-end residences and the Armani Hotel, and quaff premium wines in the lexically challenged At.Mosphere bar in the floors below. In 2012, I went for lunch and all I could see was sea bisecting sand. At 122 floors up, you feel about as connected to the city as if you were transiting through the airport terminal. with Dubai at ground level, without getting in a single lift. It’s a timely challenge: ground level design is very much in vogue across the Middle East. In neighbouring Abu Dhabi the spaceship-like Louvre was unveiled in late 2017; while across the border in Doha is the fortress-like IM Pei-designed Museum of Islamic Art. Dubai’s new (low rise-ish) design statement is the jagged glass, Foster + Partners-designed d3 (Dubai Design District) across the water from the Burj Khalifa. It’s part public art space, part hothouse for young Dubai designers. I buy a takeaway coffee from Craft Cafe and wander around one crystalline Friday morning, lying on the beanbags, getting dizzy on giant spinning-top chairs and sticking customised Post-its to the wall. A few art galleries have tentatively moved into d3, including a branch of Abu Dhabi’s Art Hub, showcasing a small array of art from around the region. Next door is FBMI, an otherwise uninteresting carpet shop aside from the fact that on my visit I found it selling a Manchester City rug (the football team owned by the Abu Dhabi United Group). In Dubai, low rise means historical, which is why my next stop is the low-slung Bastakiya neighbourhood by Dubai Creek, which dates back to the late 19th century. In a story that is familiar across Dubai, many of the blocky houses here (complete with traditional wind towers) were actually rebuilt in the 1980s. Bastakiya, also marketed as the Al Fahidi Historical District, is home to one of the city’s quirkiest hotels: the XVA Art Hotel, a gorgeous ground floor boutique doing its best to drag visitors away from the new 356-metre Gevora Hotel (the tallest hotel in the world, naturally). Compact rooms are set around a light-filled courtyard, full of trellised vines and exotic-chic cushions. A micro art gallery separates the rooms and the cafe, hanging pieces from a rotating cast of local artists. 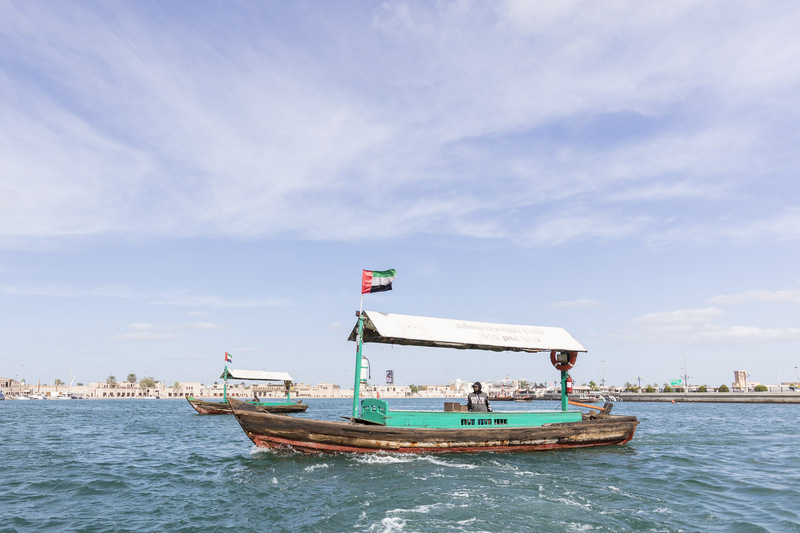 At the mouth of Dubai Creek is Bur Dubai, the starting point of Dubai in the early 19th century, when the Bani Yas tribe (which spawned the current ruling Maktoum family) moved from Abu Dhabi and found fresh water in the creek. Then, it was the main junction for trading, with boats from other emirates and Iran bobbing down the narrow creek. Now, it’s stuffed full of souks, tourists and creekside restaurants, where my guide unfortunately lets slip that ‘only the architecture is authentic’. Still, crossing the creek in a wooden abra boat is a breezy, pleasant enough 10 minutes. Across the creek is traditional Deira, and, if you ignore Ramsay, Robuchon, Rhodes et al in the money-sloshed five-stars, this is where Dubai’s best ground level eats are. Helping navigate the wide boulevards studded with mosques and traditional shops is twentysomething half-Italian, half-Egyptian Stephanie, my guide on this Frying Pan Adventures food tour. Over four hours we scarf falafel mahshi, Palestinian chicken pie, kunafa (made with cheese, ghee and noodles, and oddly delicious), Lebanese spiced dates and a pastrami-filled Egyptian pizza. Dinner of lentil soup and goat stew at Emirati restaurant Tawasol is so low-rise we’re sat cross-legged on a carpeted floor, pulling at chicken legs with greasy fingers. Okay, okay – no surprise that old Dubai is low. Modern Dubai can do ground level, too. Like the weekly Ripe Market, a farmers’ market in sun-licked Zabeel Park. It’s painfully trendy: there’s a little hut (Book Fiction) selling all types of cerebral non-fiction books, Airstream trailers selling empanadas and hotdogs and wooden boxes plying organic pumpkins, avocados and sourdough bread. Hearteningly, the entire spectrum of Dubai society – burqa-clad Emiratis, expats wearing not much at all, families with add-on nannies – is here, browsing racks of Ukrainian cotton dresses, handmade soap from Aleppo, and buying beard oil (only joking, nobody bought that). If the Ripe Market is a sign of Dubai’s pivot from glossy high-rise restaurants and bars, then sign me up for some organic sorbet and a skinny flat white. One area that’s always been low-rise is Al Quoz – which has had a short life as an industrial hub and a much longer one as a tourism destination. Today, its Alserkal Avenue has been described bossily as Dubai’s most hipster neighbourhood, which is frighteningly true: coffee joint Wild & The Moon advertises ‘gluten-free’ and ‘no additives’ on the door, while The Flipside sells vinyl records – including Egyptian jazz and the Ghost In The Shell soundtrack – for you to test out on in-res turntables. Don’t let the bulletproof coffee put you off – there’s also some good stuff happening here. I spend an hour in Nadi Al Quoz, a bookshop and cafe with beanbags, comfy hanging beds and Japanese-style wooden cabins. Then there’s the chocolate factory that smells like Willy Wonka’s emporium with beautiful Arabic-influenced Mirzam chocolates; and Chi-ka, a Japanese arts space that gives out cards for visitors to write a haiku on. By Saturday night, I’m breaking with my street level challenge and trying to get into Boa, the 32nd floor bar atop the W Dubai Al Habtoor City hotel, for ladies’ night. The girl at the door looks at my flat shoes – yes, this challenge also extended to my footwear – and flatly tells me that without heels ‘this isn’t the bar for you’. I retreat, ego bruised, to The Backyard in Business Bay, where I only had to climb one flight of stairs (ha!). Ground level Dubai isn’t just fashionable – it’s democratic, too.